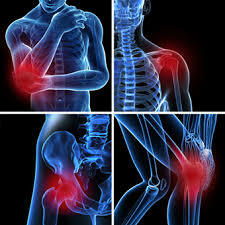 Overuse injuries occur gradually over time. When an athletic or other activity is repeated so often, areas of the body do not have enough time to heal and rest between occurrences. 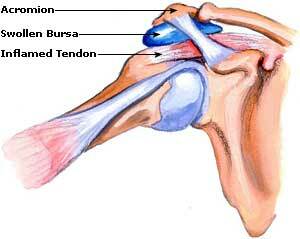 Tendinitis and bursitis are common soft-tissue overuse injuries. 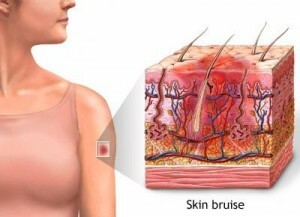 A contusion is a bruise caused by a direct blow or repeated blows, crushing underlying muscle fibers and connective tissue without breaking the skin and damaging blood vessels (haemorrhage) beneath the surface of the skin. Blood then leaks out ('extravasation') into surrounding tissues from ruptured vessels (including capillaries, but predominantly veins, venules and small arterioles) - into surrounding (perivascular) tissues. Bruises may be surface bruises, or deeper within tissues or organs. A contusion can result from falling or jamming the body against a hard surface. The discoloration of the skin is caused by blood pooling around the injury and can travel (track) along the perivascular tissues. Most contusions are mild and respond well with the P.R.I.C.E. protocol. If symptoms persist, medical care should be sought to prevent permanent damage to the soft tissues. 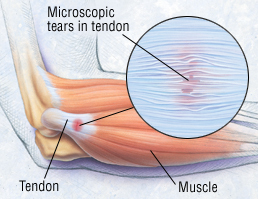 Tendonitis is an inflammation or irritation of a tendon or the covering of a tendon (called a sheath). It is caused by a series of small stresses that repeatedly aggravate the tendon. Symptoms typically include swelling and pain that worsens with activity. Professional baseball players, swimmers, tennis players, and golfers are susceptible to tendonitis in their shoulder and arms. Soccer and basketball players, runners, and aerobic dancers are prone to tendon inflammation in their legs and feet. Tendonitis may be treated by rest to eliminate stress, anti-inflammatory medication, steroid injections, splinting, and stretching and strengthening exercises to correct muscle imbalance and improve flexibility. Persistent inflammation may cause significant damage to the tendon, which may require surgery. Bursae, are small, jelly-like sacs that are located throughout the body... including around the shoulder, elbow, hip, knee, and heel. They contain a small amount of 'synovial' fluid and are positioned between bones and soft tissues, acting as cushions to help reduce friction. Bursitis can usually be relieved by changes in activity and possibly with anti-inflammatory medication, such as ibuprofen. If swelling and pain do not respond to these measures, your physician may recommend removing fluid from the bursa and injecting a corticosteroid medication into the bursa. The steroid medication is an anti-inflammatory drug that is stronger than the medication that can be taken by mouth. Corticosteroid injections usually work well to relieve pain and swelling.